So That is What Baseball Season is Supposed to Feel Like. Yesterday I woke up with a bad taste in my mouth. It wasn’t the usual bad taste, from a combination of Narragansett and lack of sleep, it was worse. It may have been the water, but it was more likely the fact that my Boston Red Sox were now 11-14 and had suffered a weekend sweep at the hands of the Baltimore f#$%ing Orioles. It was too late to say that they were still finding their groove, and that there was plenty of time to dig themselves out of any early season hole, and reports from the Herald that there was unrest in Tito’s house did nothing to assuage my fears. 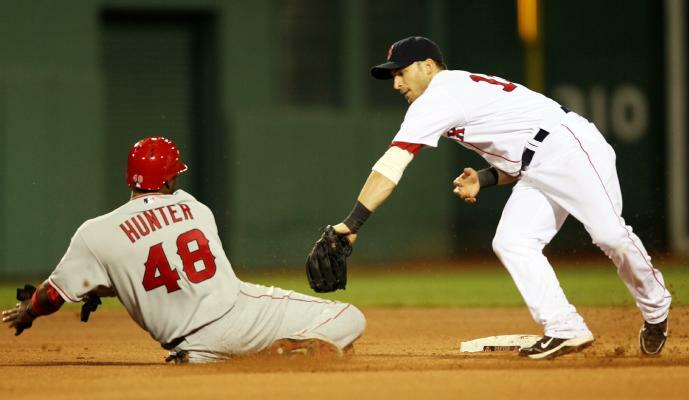 What happened last night at Fenway, however, did make me feel better. It may be a sign that things are turning around, but it also may just be a righteous beatdown that erased memories of the sad end to the 2009 ALDS. Either way, it was great. The Sox got on the board early and often, pitched well and generally went all Paul Revere on their asses (quote the Beasties: I did it like this, I did it like that, I did it with a wiffleball bat). J.D. “I’m awake, promise” Drew continued his quiet return to life, going 4-5 with three RBI to bring his once anemic average up to .247, Mike Lowell continued to prove that he should at least get a shot as an every day DH by going 4-4 with three doubles, four knocked in and a walk (say goodbye, Papi), and even Beltre and Bill Hall finally got into the act by hitting their first home runs in a Red Sox uniform. 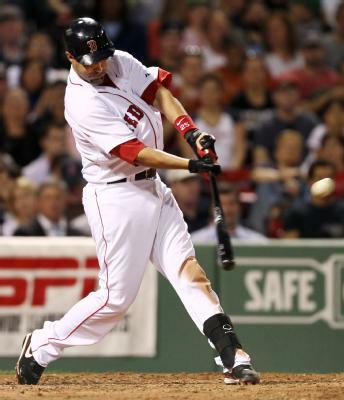 To top it all off, old reliable Youk and Pedey chipped in with homers of their own. Victor Even Chipped In By Nailing a Base Stealer. Was it a sign of things to come? We can sure hope so, because I am sick and tired of seeing sub-.500 numbers and the (Roy Halladay-less) Toronto Blue Jays ahead of us in the standings. I don’t know if this was brought on by one of those players only meetings, if the hazing of the new guys ended or if the old guard was just so pissed about what happened last fall that they put everyone else in line, but something happened. It got so bad for the Angels (17 runs, 20 hits) that when Delcarmen took the mound, and looked absolutely dominating (sorry about blaming you for everything, you have been the one truly solid reliever these past few weeks), in the seventh inning, he and Victor were practicing calling pitches the way that they do when there is a runner on second. Practicing. That’s how much they want to win. There are still warts, and who knows if this was a step in the right direction or just a blip on the radar, but it was good. Schoenweis gave up four in the ninth, continuing his lack of effectiveness, and Buchholz actually had his worst outing of the season (5-2/3, 4ER) but a win is a win. Now they’ve pulled me back in. P.S. This is the song I got in my head every time Lowell came to bat.